Chateauneuf is back for WINE #4!! A tiny batch of this one - don’t even hesitate! One of Wine Spectator’s highest rated wines of the entire 2014 vintage, Last Bottle probably owns the majority of all the cases that were even imported into the U.S.! Oh…and…at WAY MORE than 50% OFF! Crazy! 95 POINTS! SO good. So complex. Gotta love the pure-as-the-driven-snow kirsch and raspberry fruit, but all that black tea and sweet herb thing going on just seals the deal. Wow! So little...we hope you can snag a few!! Let’s see what else we can dig up!! This is FUN! We’re on our 3rd glass of wine! This cuvée comes from a single vineyard of old Grenache on sandstone at the top of one of the hills of Châteauneuf-du-Pape. The nose reveals notes of raspberry coulis and black tea, the mouth is on the freshness and the fineness of the old grenaches on sandy soil. The aging in half-muids of more than 3 wines emphasizes the fruit without denaturing it. The Château Vaudieu, located in the heart of the Châteauneuf du pape Appellation, was built in 1767 by Admiral Gérin, a lieutenant in the Marseille admiralty. It is one of the three genuire castles of the XVIIIth century in Châteauneuf du pape. For over 250 years, the "Val de Dieu" (Valley of God), an area suitable for cultivation from which the name "Vaudieu" was to come, has sheltered a vineyard within its landscape of hillsides and terraces that enjoy the best possible exposure. In the mid 19th century, just before the phylloxera crisis, the estate was one of the four great Chateauneuf du Pape vineyards, able to produce over 200 hl of quality wine. It was under the leadership of Garbriel and Juliette Meffre that the vineyards reached their current size of 70 ha within a 450 m radius of a bicentennial Lebanese Cedar, a special guest at the 18th century Chateau. Upon the death of Gabriel Meffre in 1987, his daughter Sylvette Bréchet took the destiny of this magnificient property in hand. In 1990 she was joined by her son Laurent, and then by Julien in 2006. With their involvement, the winery was modernised in order to separately handle the grapes from the 32 vineyard plots that were re-demarcated in order to achieve the best potential from each "terroir". 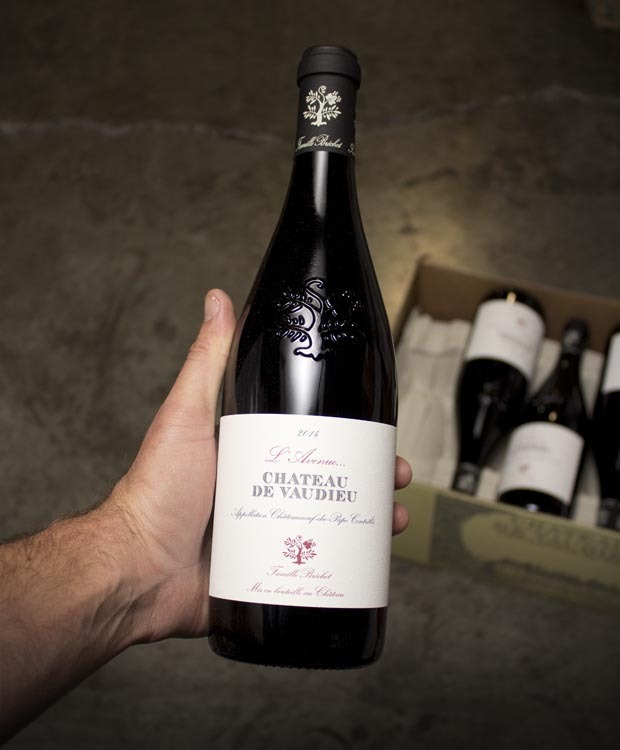 The elegance of the Vaudieu "Terroirs", enhanced and magnified in this way, has ensured that the reputation of the estate's wines has become well established over the years. Laurent Bréchet, supported by a team who is totally focused on quality, continues this painstaking work respecting the terroir and this very special environment, giving birth to the prestigious "Amiral G", "Val de Dieu", and "Clos du Belvédère" wines. Roast veal smoked in vine shoots, red wine jus, candied carrots and asparagus sauteed with old hazelnut.